Rats are omnivores whose diet includes vegetables, grains, dairy and meats. Highly nutritious food is essential for pregnant rats. During her pregnancy, your rat will also need more food than usual. The extra nutrients will give her enough energy to nourish her young, so they will develop properly and grow into healthy babies. Rats eat small amounts of food throughout the day, so make sure your pregnant rat always has healthful choices available. Pregnant rats need additional protein, so be sure to include some healthful sources throughout the day. In addition to a balanced staple such as high-protein lab blocks, your pregnant rat will enjoy scrambled eggs; cooked, low-fat meats such as chicken and fish; cooked tofu and healthy high-protein treats. A pregnant rat’s diet should include a variety of fresh fruits Try to give your rat about a tablespoon of fruit daily, such as a piece of banana or a slice of pear or apple. Rats have flavor preferences, and some popular fruits are cantaloupe and other melons, strawberries and peaches. Blueberries and blackberries are rich sources of antioxidants and a tasty treat for your pregnant rat. Fruit is full of natural sugar, so small portions are best. Before you serve your rat fresh fruits, wash them well to protect her from pesticides. Vegetables can be served raw or cooked. Your pregnant rat might like to nibble on a raw cauliflower or a broccoli floret, and on cooked or raw carrots. Give your pregnant rat some peas, cooked beans or corn. Bok choy is a rich source of vitamin C, vitamin A and phytonutrients, and it can be fed either raw or cooked. Rats love the flavor of sweet potato, which must be thoroughly cooked before offering it to them. It is a good idea to remove vegetable leftovers from the cage after a few hours so they won't spoil. Give your pregnant rat a small bowl of cooked whole grains, or combine the grains with their vegetables. Cooked flaxseed, barley, brown rice, quinoa, barley and buckwheat are healthful for rats. You can mix plain, cooked oatmeal with cow's milk, goat's milk or soy milk for a protein-rich cereal. One recommended way to meet rats' nutritional requirements is to feed pre-formulated laboratory block diets or vitamin-enriched mixes. If the blocks are part of your rats' diet they are likely to get the nutrients they need, in part because they won't be able to skip nutrients by picking out their favorite foods. If rat blocks are the staple, you should keep some in the cage at all times. To prevent them from getting damp,put them in a container that can be clipped into the cage rather than left on the cage floor. People who study, write about and love rats disagree on whether soy is good or bad for rats. You can learn the reasons behind this debate and decide for yourself whether to feed your pregnant rat blocks that include soy products. Whichever you choose, your rat will need a high protein variety. A pregnant rat’s diet should not be high in fat, sugar or sodium. Certain foods are forbidden because they could seriously harm your rat. These include raw dry beans, raw peanuts and raw sweet potato, which contains compounds that create cyanide. Other dangerous foods are green bananas, raw potatoes, green potato skin and raw bulk tofu, which can contain bacteria. Rats should always have access to food and water. 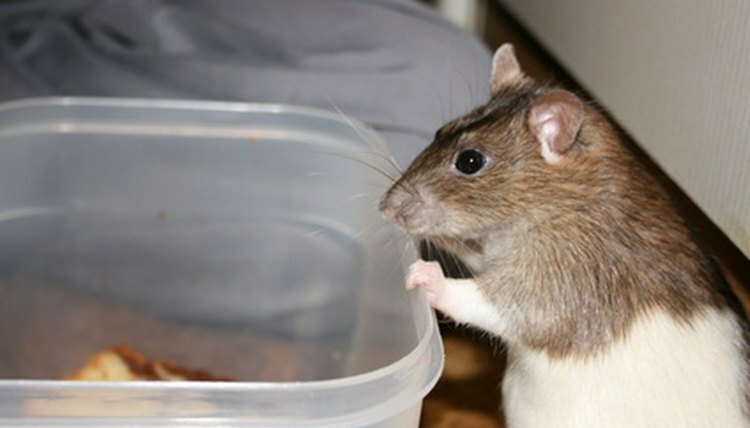 It is essential that pregnant and nursing rats have fresh water in their bottles at all times. Check the water level regularly so you'll know when it needs to be replenished. Don't just top off the bottle; rinse it out and fill it with fresh water each time. What Does a Rat Eat in the Wild?